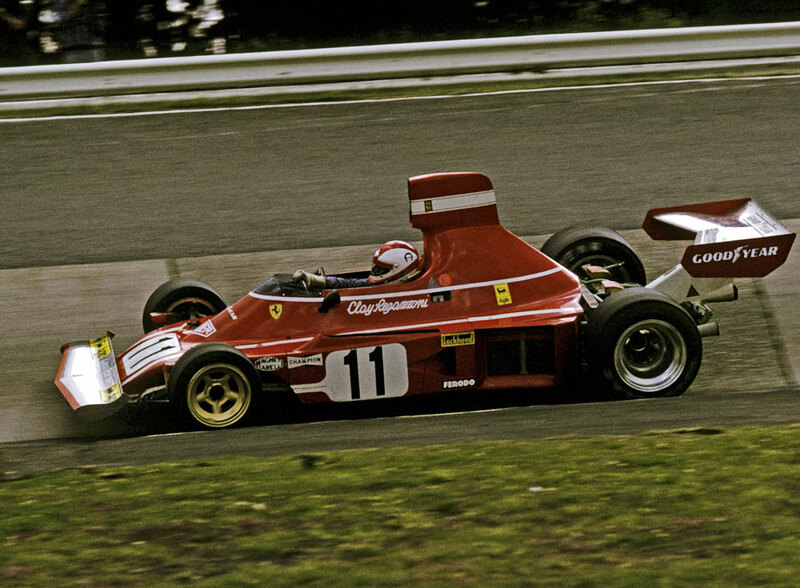 Ferrari's Clay Regazzoni mastered the daunting Nurburgring to lead all 14 laps of the German Grand Prix and finish over 50 seconds ahead of Tyrrell's Jody Scheckter in second place. Regazzoni hardly put a wheel off line all afternoon, but Scheckter drove the majority of the race anticipating disaster after he came together with Niki Lauda on the first lap. Lauda, who started from pole, was attempting to pass Scheckter when his Ferrari veered into the side of the Tyrrell under braking and shot off into the crash fencing. "I braked and the car pulled over to the right," said Lauda. "I hit Jody, my car flew into the air and I went into the safety fence backward. I hit it with a tremendous bang, but I am alright." Lauda had hit the barriers at 120mph, but while he explained what happened to the press in the safety of the paddock, Scheckter soldiered on with a car that could well have been critically damaged. However, the South African held his nerve and kept Carlos Reutemann and Ronnie Peterson at bay in the closing stages to take second in the race and second place in the championship. On his final lap Scheckter came across a reminder of the dangers of the Nurburgring at the infamous Pflanzgarten, where Mike Hailwood's McLaren had become airborne and crashed heavily into the barrier. It wasn't until the race had finished that Hailwood was cut free from his car, his legs fractured in several places. For the ex-motorbike champion it was the final straw - he had a big shunt during practice as well - and he decided to retire from racing altogether. The result meant Regazzoni led the championship, with Scheckter second and Fittiapldi, who had retired with suspension trouble, third.